Getting married is a joyous and exciting time to celebrate a union between two people. It is a once-in-a-lifetime opportunity to create a memorable experience with an extra special catered affair for friends and family. Our team of experienced professionals is ready to guide you through every stage of the planning process to craft a perfect day for a personalized and inspired celebration. Eggwhites is the best wedding caterer in South Florida because we recognize that each and every couple deserve our full attention to create an expressive and beautiful event that you and your loved ones will cherish forever. As a recognized leader in South Florida wedding catering since 1994, Chef Gary Lampner and Eggwhites Catering bring the highest standard of excellence to the art of the party. An Eggwhites wedding reflects our philosophy of impeccable attention to detail and caring service. We will design a personalized wedding program including menu, vendor recommendations, and event day venue logistics. Whether you are planning an intimate beach wedding for family and friends or an elaborate, formal seated dinner for 300, we will work with you to make sure every detail is perfect. 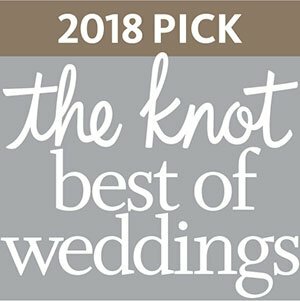 Our reputation and experience catering for weddings have helped us establish extensive relationships with the finest South Florida wedding planners, photographers, florists and rental companies in the business. Our wedding reception catering consultations and complimentary menu tastings ensure that we have captured your vision perfectly to provide you with an enjoyable wedding planning experience. A first-class event starts with delicious food that is beautifully presented. Our food and beverage presentation is crafted to enhance the guests’ experience and every menu is tailored to appeal to the taste of each individual client. We can accommodate any dietary requests you might have including plant-based, vegetarian, vegan and gluten-free menu options. We will recommend fabulous food and wine pairings, and our sophisticated knowledge of mixology allows us to create special craft cocktails to get your party started. Download our wedding catering menu samples to view some of the many menu options available to you. Eggwhites full-service catering can include custom menu planning , table settings and linen selections, décor and floral stylings, tents, staging, lighting, and sound. We have extensive relationships with the best vendors in the business to ensure that your event is truly one of a kind. We will help you stay within your budget and provide creative and cost-effective solutions to make your wedding as beautiful and special as you have always dreamed. We provide exact costs early in the planning process so there are no surprises or hidden expenses. Eggwhites Catering is a preferred caterer at many of the most desirable wedding venues in Miami, Fort Lauderdale, Palm Beach and the Keys. Still looking for the perfect wedding reception venue? We can help! Take a look at some of our favorite wedding and event venues. If you are planning on saying "I do" in the upcoming year, check the Eggwhites Catering Blog for the latest trends forecasts! We offer lots of tips and unique ideas to help you make it memorable. The Eggwhites Catering team is proud to be honored for excellence as one of the best wedding caterers in Miami by The Knot and WeddingWire. Learn more about our prestigious awards and the vast resources offered by these two wedding industry juggernauts. 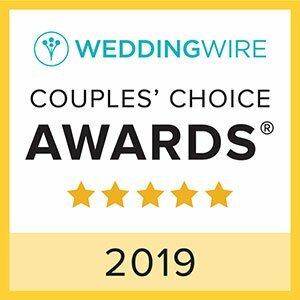 The Eggwhites Catering team is proud to be honored for excellence as one of the top wedding catering companies by these two well-established leaders in the wedding industry. 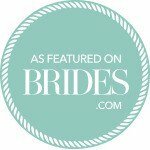 WeddingWire and The Knot provide ideas, inspiration and planning resources for couples planning a wedding. Couples return to these planning sites numerous times during the planning process to use the vast resources offered by these wedding industry juggernauts. Eggwhites Catering has repeatedly been the recipient of these esteemed awards since the awards' inception. 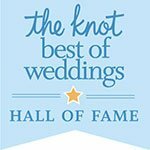 In 2017, Eggwhites Catering was inducted into the prestigious The Knot Best of Weddings Hall of Fame, which recognizes exceptional wedding professionals who have earned four or more of The Knot Best of Weddings awards. 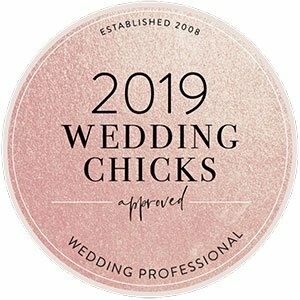 This accomplishment shows that we offer consistent excellence in quality, service, responsiveness and professionalism to our couples and clients who hire us to cater what may be the most important day of their life. Couples have been successfully planning their weddings for hundreds of years. Now it's your turn. 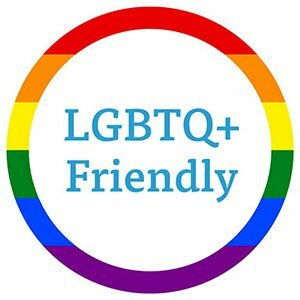 Eggwhites Catering is a proud LGBT wedding vendor. In fact, check out Dana and Janice's Love Story in Just Vows, South Florida's Gay and Lesbian Wedding Resource Guide. 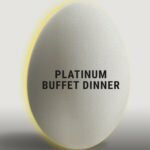 On pages 22-23, they share their experience with Eggwhites Catering from early planning to the day of their celebration. 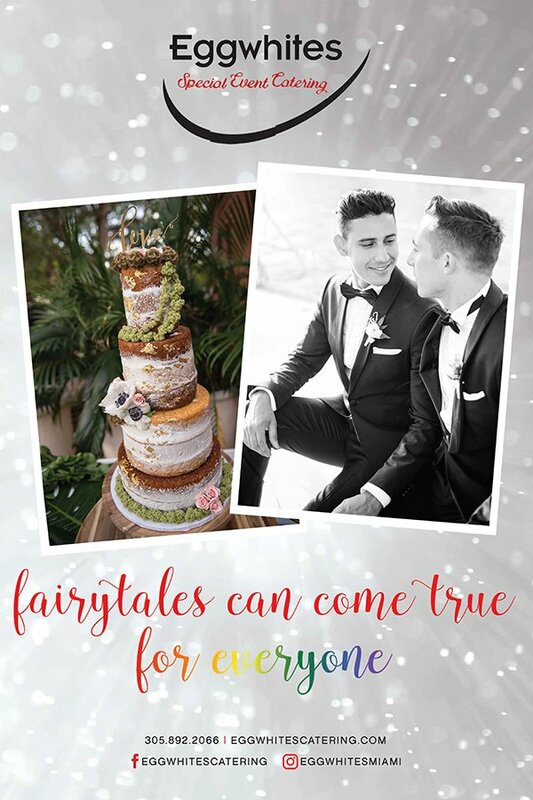 For some helpful advice on How to Choose the Perfect Caterer for your LGBT wedding, read our article on page 26 of the Just Vows GFLGLCC-Greater Fort Lauderdale Wedding Resource Magazine. My husband and I worked with Sarah, Chef Gary, and the rest of the Eggwhites catering crew on our January wedding at the Ancient Spanish Monastery this year. We reached out to Eggwhites and booked our contract six months prior to the wedding date. Every step -- from the contracting, to the tasting, to the finalizing of the menu, to the execution on our special day -- was handled deftly by our catering manager Sarah, who remained our principal contact throughout the whole process. 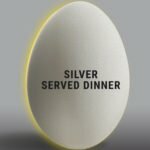 We knew from the reviews on this and other sites that we were getting the best possible service from Eggwhites, and they did not disappoint. Our guests had endless compliments for the delicious food and drink (we had pre-ceremony appetizers and drinks, a wonderful dinner with table service, a cake, an open bar, and even some late night snacks). There are probably dozens of things that we'll never find out about that Sarah and her crew did for us to make that day so unforgettable, but here are a few we do know about: Sarah helped put corsages and boutonnieres on the wedding party, marshaled the florist / sound equipment guy / string quartet during the prep period, got some last minute party favors neatly placed at each table setting, and swiftly moved our guests from garden to loggia to cloister as the program progressed. We cannot thank Eggwhites enough and we will never forget our wedding day and night because of them! 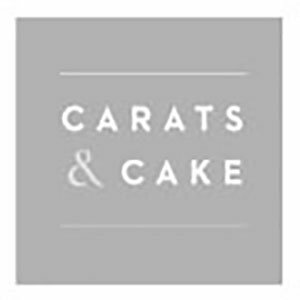 "One of the best decisions we made as we planned our wedding was choosing Eggwhites as our catering company. Once we made this choice- everything else fell right into place. Sarah was beyond helpful- she is very well organized, an expert in her field, and above and all- very sweet and approachable! We were sold! As the day approached, Sarah checked in with us several times- made sure we had all other things in place (tents, lighting, florist, photographer etc). Several other vendors (our tent company for example) were also elated to hear we were working with Eggwhites - they recalled having had very pleasant experiences working with them in the past. On the day of the event itself- we had absolutely no issues whatsoever- the food, ceremony etc was extremely well orchestrated and everything went seamlessly well. We simply sat back and enjoyed as our dream wedding as it unfolded in front of our eyes ? The guests were very pleased with the food and service, as were we. We are truly grateful to Sarah and her entire team for making our day so special! If you are looking for a caterer in SoFlo, look no further!" Kevin and I are so grateful to have found Eggwhites Special Event Catering. Sara was extremely professional and provided quality customer service. When we first walked in the room to do our tasting we knew from the atmosphere that Eggwhites was the right choice. We were welcomed with a lovely presentation and AMAZING food selections. We even met with Chef Gary Lampner as well as the chef that was assigned to our wedding during. Sara and Ashley went above the call of duty. They answered all questions and addressed any concerns that “I” had… I think I may have called them 10 times in one day and they both were ever so pleasant. Lol. On the day of our wedding, the setup that Eggwhites created was amazing. Now let’s not forget that we received so many compliments from our family and friends. Everyone said that the food at the cocktail hour and the reception was INCREDIBLE. Even though it's three months later we still receive calls about the food. It was a pleasure working with Eggwhites and they will always be our catering selection for any future events. Sarah and her Eggwhites catering team provided catering for my daughter and her husband's Wedding Reception. There were major "hiccups" the day of the Reception (nothing at all caused by Sarah and Eggwhites) In fact, Sarah and her team literally "saved the day". Sarah remained extremely calm while working through the issues and she was extremely accommodating (when she had every right not to be) It was a beautiful Wedding Reception. The food was beyond amazing and delicious, the Cocktail Hour as well as the entire dinner. Sarah and her team were very friendly, professional and certainly went well above the call of duty. Thank you, Sarah and your Eggwhites team. It is a pleasure to recommend you. So grateful to the whole Eggwhites team for making my wedding day a success! The tables, chairs, silverware, setup was beautiful and the FOOOD, oh the food was divine! The food the day of was exactly, if not better, than the food at the tasting. Everyone still talks about the passed hors devours (however you spell it) at my wedding! As I was taking my photos one of the servers was right by my side to make sure I was fed as the bride. Thank you Sarah and the whole Eggwhites team!! Forever grateful! We just need a few details from you first.